It’s either the biologist or the child in me (most likely both) that makes me really love zoos. I feel like I should hate zoos or feel more guilty about these wonderful “wild” animals being held captive for our viewing pleasure. 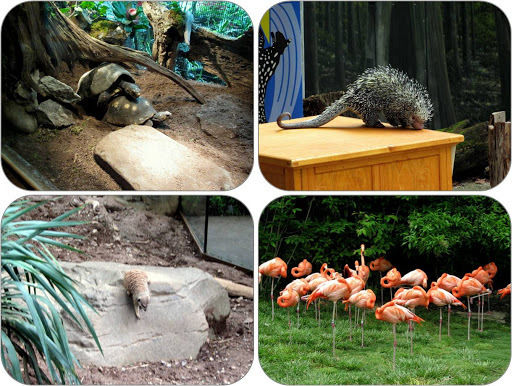 However, zoos have played important roles in conservation and in many cases if the animal wasn’t in a zoo, it would be in danger of poaching or extinction through more widespread, long-term, and very real threats like climate change and habitat loss. So really, in light of how the planet is pretty much going to break down and go haywire someday, keeping a few well-cared-for gibbons in an enclosure designed specifically for their needs doesn’t seem so bad. Man, that got dark (I should probably lay off the dystopian novels). Here are some animal photos from the Nashville Zoo to cheer you up! 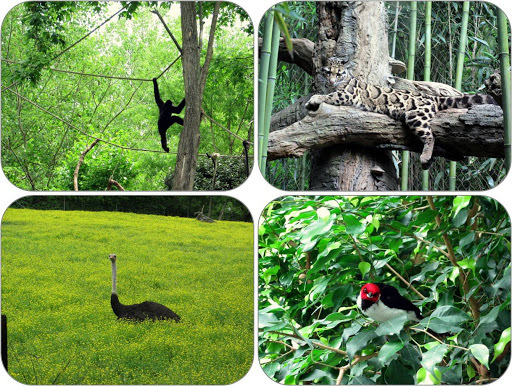 We saw very athletic gibbons, playful cloud leapords, the rare and unusual ostrich flower, and the original angry bird. We saw a pair of supremely happy tortoises, a curious porcupine, swift-footed meerkats, and graceful flamingos. And there were domestic animals! 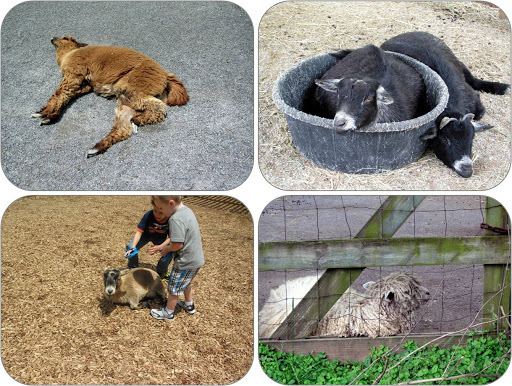 A dead sunbathing alpaca, goats-in-a-bucket, goats-about-to-headbutt-overeager-little-ones, and the rare conservation breed of sheep, Cotswold. They had one of those enclosures where you can go in and feed I-totally-forgot-what-kind-of-bird some nectar, I love those things. This photo shows me, my little-cousins-who-feel-like-siblings Megan and Austin, my kinda-freaked-out-Dad, and my dear Fiasco. 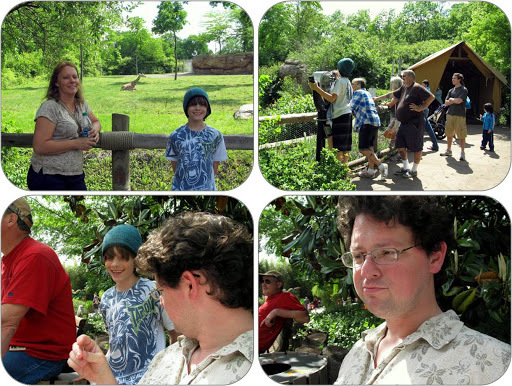 And some final photos, on top is my aunt and cousin Austin with their buddy the giraffe and a photo observing my family observing the giraffes. Bottom left is my Fiasco attempting to convince Austin to eat a bacon-cheddar-flavored cricket (yes, cricket). Bottom right is the Fiasco’s face after Austin wisely refused and he ate the cricket himself. Mwahahaha oh man, it cracks me up every time. I hope you enjoyed our little trip to the zoo! 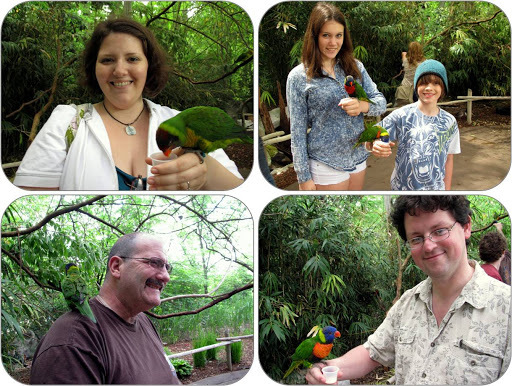 What’s your favorite zoo animal? Love your photos!! The flamingos & the giraffes would've been my favorite from your zoo! At our zoo, we always like searching for the lynx (maybe a different small cat, cannot be entirely sure) or the wolves. We have otters that are fun to watch too!